WARNING: This post may contain Excessive Superlative Expletives. Use extreme caution while reading. 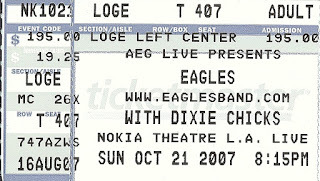 I've been to a few concerts but none of them knocked my socks off like the Eagles. It was crazy amazing or, as the wife described it, crack-head amazing. We left the house early not knowing how the fires burning in the area would affect the LA traffic. We stopped at an In N Out Burger in Camarillo for some dinner before making our way south. To our relief, as we headed south, the smoke in the air cleared revealing a clear blue sky. Traffic was not nearly as bad as I worried about. We arrived at the Nokia Theater about 45 minutes before they opened the doors. This theater, which seats 7,100, celebrated it's grand opening last Thursday so everything was still spotless and shiny. We perused the shirt stand and I bought a very cool but very over priced t-shirt. The doors opened and we made our way to our seats. We were about as far back as you could get but no seat in the theater is more then 210 feet from the stage and there are no obstructions. I keep forgetting to bring my binoculars. There are also two huge screens on either side of the stage guaranteeing a view where ever you are seated. The warm up band was the Dixie Chicks. Going into this concert I had only heard a smattering of their songs and owned one of their albums, "Taking The Long Way ", which I liked very much. They sang a mixture of songs from this album and a mix of older songs including Wide Open Spaces which I recognized. In general I liked them. It always helps to know the music when you go to a concert and my experience with the Dixie Chicks was limited but I enjoyed their hour's worth of music never the less. 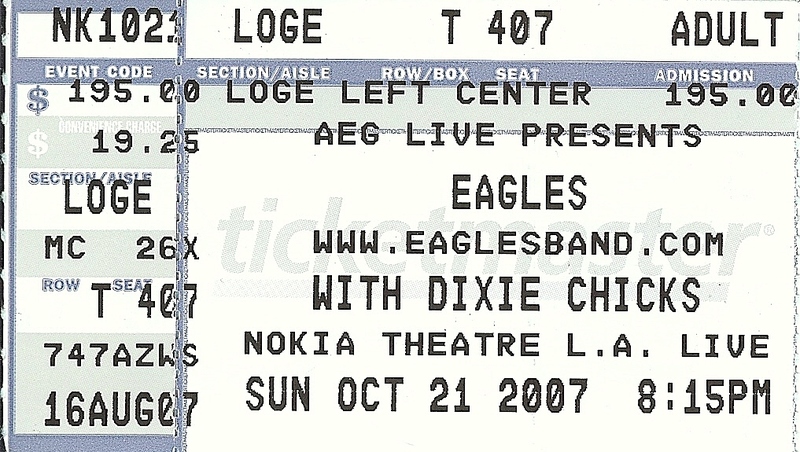 The only irritant was the two Dixie Chick fans two rows ahead of us who insisted in standing, dancing, and singing the songs to each other throughout the entire performance. Fortunately the screens let us see most of the action and the sound in the theater was good enough to drown out their accompaniment. I was also seated next to another dancer who always seemed to be dancing at a different tempo then the music being played. I had to duck a few times to avoid her flailing. She also liked to talk to the performers on the stage like they could really hear her. Twilight Zone time, people! After a brief 20 minute intermission, the Eagles came on stage. They had added three more screens above the stage, showing you even more of the performance. They started off with four songs from their upcoming album "Long Road Out of Eden". One song was sung by each of the band members (Don Henley, Glenn Frey, Joe Walsh, and Timmy Schmit). The audience enjoyed this but were rather sedate as no one really knew their new stuff. Then they broke out their old stuff, starting with Hotel California - W*O*W - totally awesome. They went from one great song to another. They even included some of their solo stuff like Henley's Boys Of Summer and Dirty Laundry. The wife and I both agreed that we needed to hear Joe Walsh sing Life's Been Good. AND HE DID!!!! Totally cool awesome a lot ... man! Joe Walsh plays a wicked guitar. Spectacular! Joe Rules! He changed one of the lines to "How bought them Lakers, they're crap without Shaq" - the crowd roared!! How incredibly awesome is that!?! Really BIG awesome. That's how awesome! Throughout the concert you could hear the murmur of the audience singing along with the band. I would say that 90% of the people in the audience knew the lyrics of every song. This just made everything better - everyone had a great time - I know I did. I knew all the songs and they played all my favorites - Hotel California, Peaceful Easy Feeling, Take It Easy, In The City, and on, and on. Supremely Awesome Extremely Cool ... In The World ... Ever ... A Lot! Yowza! After the last encore (Take It Easy and Desperado) we made a quick exit. I was surprised that my ears weren't ringing like they usually do after a concert. I attribute it to the better acoustics of the Nokia Theater - they didn't have to play the music as loud as other venues. On the way out, the wife said that this concert ruined us as no other concert would ever measure up. That may be true. The wife placed this concert in her top five. On the drive home (in record time I might add) I thought back to all the concerts I'd been to since my first back in July 1980 (Journey). This concert was probably my best. We turned off the lights at 12:45 am and I fell asleep to the whoosh of the Santa Anna winds outside the window and the echoes of a great performance in my head. Next concert - yes, there is another one - the B-52s in three weeks.